Project SCENe is one of Stickyworld's current Research and Development projects. It's high profile because it's about accelerating the adoption of 'green' community energy schemes in the UK. We are central to the project team's capability to explain to a new community of homeowners at Trent Basin in Nottingham, UK, about the benefits of participating in such a scheme and to encourage uptake. If the project does this well the team will learn and create a blueprint for the future. It's a complex idea so, to demystify and explain it, I've been using Stickyworld's unique capabilities to create virtual tours. Stickyworld virtual tours are a really clever way to invite your customers to explore a complex environment or idea and to engage with you online. Virtual tours have huge potential for lots of use cases in different industries and projects so I wanted to share what I have been doing. 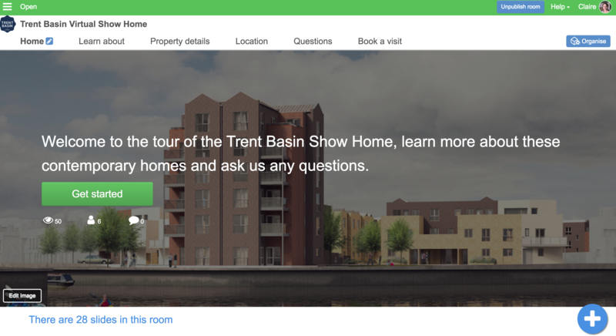 Working with housing developer Blueprint we've created a virtual tour of the Trent Basin showhome. A link to this will be published shortly on the Trent Basin website. 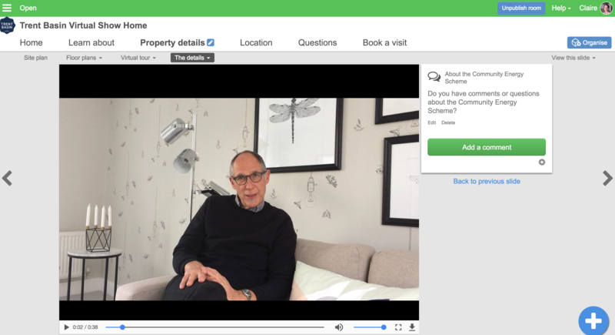 Any potential homeowners will be able to visit the showhome online, explore it, ask questions and receive feedback. It's a great way of supporting the marketing and sales process and having more informed customer conversations. 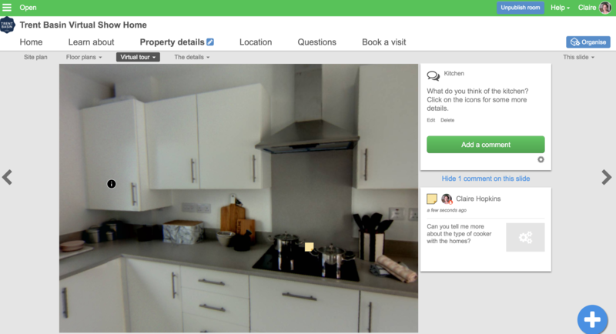 What's innovative about a virtual tour on Stickyworld is that it's possible to share 360 photography of exterior and rooms and enable customers to use the commenting features to stick questions or comments on particular aspects of the view. To take the 360 photography of the rooms I used a NCTech Iris camera, but the panoramic photography can be just as good using most smart phones. We augmented the virtual tour by adding information hot spots, for example about the energy saving features of the boiler, the windows and the shower. The other Stickyworld feature we utilised was the ability to embed short videos giving visitors a personalised snapshot of information. All they need to do from within the tour is to click on the camera icon and the video appears. 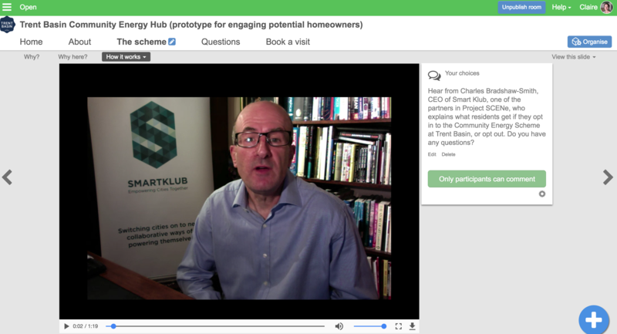 In the screengrab below you can see Nick Ebbs, CEO of Blueprint, introducing the merits of the Project SCENe community energy scheme. As vistors take the tour it's easy for them to find answers to their questions, leave new questions and receive responses from the organiser. The agents' contact details and the relevant social media links are included in the last slide. When it's published Blueprint expect their virtual show home to be a key part of their marketing strategy and to encourage faster sign ups for property viewings. They also want to build awareness and understanding of the Project SCENe community scheme at Trent Basin and its benefits to potential residents. I've also been developing a virtual open day of the Project SCENe community energy scheme on Trent Basin's Stickyworld portal. 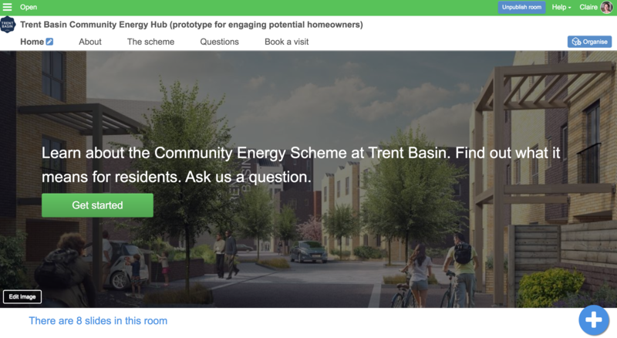 Using a slideshow consisting of different digital media it cleverly explains what community energy is, how the Project SCENe scheme will work at Trent Basin and why residents should sign up. It's still a prototype but we hope to publish it shortly. The virtual energy hub will give more people the chance to understand community energy, get immersed in the complex details, and find out more. They can ask questions and explore what it means whenever they want to, all online 24/7. To make the tour a compelling experience, there is a welcome video from University of Nottingham research lead, Lucelia Rodrigues, and short embedded videos from other project partners explaining about the PV on the roofs of the homes, the battery and how the scheme will operate. The virtual energy hub is an innovative way of educating and engaging customers and it's all part of Project SCENe's commitment to engage people in a modern, inclusive and transparent way. Later in the project, we will be sharing energy data on the hub and exploring customer and community needs as they embrace the scheme. So how are virtual tours relevant elsewhere? We've used them for Project SCENe because we need a way of using different digital media to explain a complex idea online, and to provide the means for more people to engage with the scheme and have their questions answered. This need is equally relevant to other situations. The Design Museum used Stickworld to create a virtual tour of their new location before they moved. Their aim was to explain the new environment using 360 photography and to ask the public for ideas on how to improve it. You can read our case study here. Sustrans, a charity comissioned by Hexham Town Council and Northumberland County Council, used 360 photography to create a virtual tour of Hexham Marketplace using Sitckyworld. Their aim was to stimulate ideas from local residents and traders about how to improve the market area, and you can read this case study too. Virtual tours can be used by any organisation or project team wanting to explain and discuss a place, building, interior or idea with customers. For utilities companies this could be engaging and explaining to customers how the water gets from reservoir to tap, or for opening up the doors to your head office 24/7. For construction companies a virtual tour provides a compelling way of explaining to people how things work within the building, for example heating systems and other devices, to promote better use and save costs. Stickworld virtual tours are relevant to innovation projects and where change needs to be explained, understood and embraced by stakeholders and customers. If you are interested in learning more about how to set up a virtual tour on Stickworld read our How to guide on virtual tours. Contact us if you'd like a demo on how this could work for your organisation.